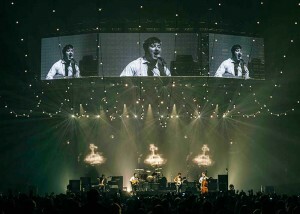 MDG, exclusive distributors of Robe and Chromlech in Canada and manufacturers of industry standard MDG atmospheric generators, provided lighting, fog and haze effects for Mumford & Sons’ mammoth 145-date international 2013 tour. MDG supplied fifteen Robe Robin 600 LEDWash and sixteen Robe Robin 1200 LEDWash moving heads, plus a quantity of Chromlech Elidy LED lighting panels composed of 64 Elidy-Wall LED panels arranged in a 16 wide by 4 high video backwall, and 12 Elidy-Big and 12 Elidy-S panels rigged above and behind the band on stage. The tour marks the largest installation of the French lighting manufacturer’s new product to date and the first project for MDG to supply with Elidy since its appointment as exclusive Canadian distributor. MDG also provided two of its own, unique dual fog and haze generators, MDG theONE. These were located on either side of the stage to provide a highly controllable output of haze that showed off Ed Warren’s spectacular lighting design to perfection. "Smoke and haze suits the band’s style really well," says Warren of Next Level Lights who has toured with Mumford & Sons as lighting designer since they started five years ago. "I use a lot of back light and overhead haze, so it’s a vital part of my design." The haze was able to highlight the unusual mid-air effects Warren created including those from the Chromlech Elidy with which he was able to paint shapes including squares and circles. These radiated as thin pencil beams through the smoke and delivered unique perspectives to the audience sightlines at the side as well as head on. "There was a significant challenge to the haze effects in that ninety-five percent of the shows on our tour took place in the open air," continues Warren. "Trying to get a good spread of haze in outdoor conditions can be very frustrating. However, theONE was awesome and was able to provide a really strong haze, even outdoors. Its powerful fans and strong fogging ability kicks out such volume that I didn’t even need them to run full time - and they always had plenty left in reserve, even on windy days. "Yet when we played the indoor venues, theONE’s controllability meant I could tone down the output to a much finer level which I chose to do using local control via my team on stage. They are very controllable (theONE, not the team!)." 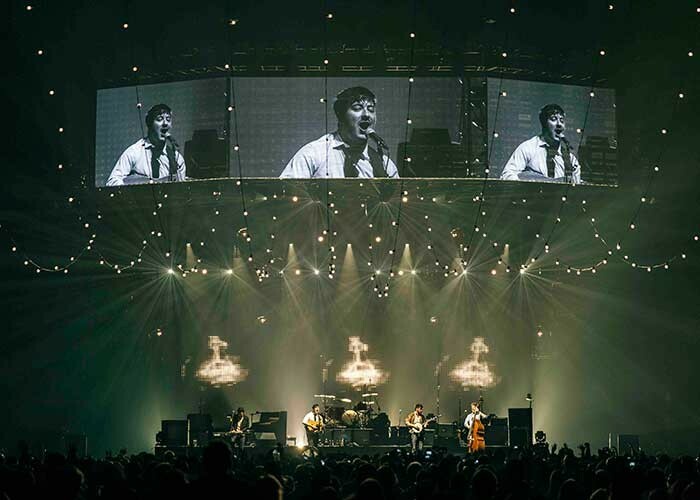 MDG supplied the Robe, Chromlech and MDG equipment to Canadian lighting, sound and video supplier, Solotech, who looked after Mumford & Sons for the US leg of the tour, while Neg Earth supplied the UK leg with the Elidy panels supplied by Solotech. "The service from MDG and Solotech was great," says Warren. "Both companies couldn’t do enough to help and did a great job in getting the show on the road within a very short timeframe."